In June 1348, the Black Death entered England. Not known to the people at the time, it was spread by a single ship arriving from Europe in Dorset. 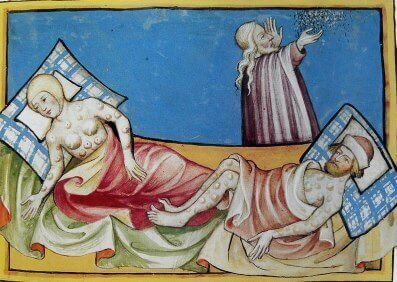 At the time, there was a huge outbreak of the plague in Europe. Millions of people were dying from it. But, since Britain was an island, until June 1348, it had largely escaped this outbreak. How did the outbreak in Europe start? We don’t know for sure, but some people said that the germs of the disease came from large pools and lakes in marshlands in Asia. Others suggested that Jewish people polluted drinking water in major cities in Europe. (Many people hated Jews as they thought that Jews killed Jesus, when in reality, the Romans killed him. Jesus was also a Jew himself.) Some also said that the Black Death was a punishment from God for failing to follow the Bible. But the average person living on the street didn’t really care how it started. Instead, they would have worried about the fact they could get it at any moment. What were the first signs of the Black Death? Was there a cure to the Black Death? Medicine hadn’t come a long way in medieval times, so they didn’t know that germs caused disease etc. People at the time thought if the swellings burst on the 4th day, then there was a very small chance that you would survive. We now know that 70% of people with the disease died within 5 days. The disease eventually became airborne, meaning that you could get the disease just by breathing! After this, 100% of those who got the plague died. Whole villages were wiped out by the plague. In total, a third of the entire English population died. But those who survived had better times ahead of them. Thanks to the Black Death, those who survived had better life chances and higher wages than before. The Feudal System (where the peasants got paid next to nothing and the nobles/barons got paid a lot for maintaining the King’s land), which was put in place after The Norman Conquest, was abolished as there weren’t many peasants left. Because there wasn’t a lot of workers, nobles started offering higher wages and the workers could negotiate with their bosses without being fearful. Taxes also went down and there was a lot of food for those who survived, meaning everyone lived better. However, not everyone (who was still alive) benefitted from the Black Death. Jewish people were blamed for spreading the disease, and were tortured and kicked out of their countries across Europe. The Church, which was very powerful before the Black Death, wasn’t very powerful afterwards as people started to wonder why those with power weren’t punished.